It’s 10.30pm on a Friday night, and somewhere on the 28th floor of a skyscraper in Roppongi, my work phone is ringing. “Uh, hello?” My eyes are struggling to focus on the caller ID, having spent the last 3 hours glued to a Share Purchase Agreement that now leers at me from my computer monitor. “You sound like a man who needs a drink,” my friend Denny shoots back with an unjustifiable perkiness. Now squarely focused on the flickering keyboard cursor, the enormity of the task before me begins to sink in. Working at an internal workstation will drive the sanest man crazy, and I decide what I actually need to do is take an evening stroll and reassess. Get a fresh perspective. It wasn’t always like this. I started my career like many other young lawyers, spending the first 3 years working in New Zealand for a mid-sized firm. I had shunned the idea of working for a huge firm doing (what I regarded as) menial corporate work, and instead cut my teeth on family and employment law, which no-one could call dull. After spending the next couple of years in London doing child protection law for a local authority, I made the dubious decision to follow love to Tokyo, with thoughts of my career far from mind. 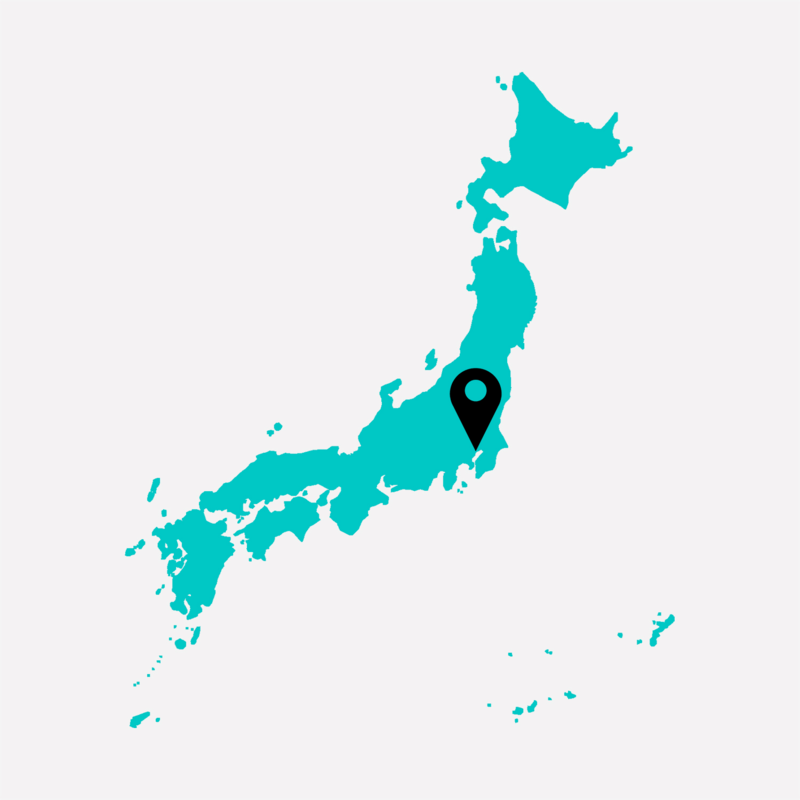 Sheer luck resulted in a job at one of Japan’s biggest law firms. It’s not something I want to do forever, but it can be difficult to carve out a career niche here as a gaijin (foreign person). There are well-worn paths for career commuters: English teaching or hospitality jobs (with equally nocturnal hours), but a fast-devaluing yen (thanks, ‘Abenomics’) has made those less attractive options, particularly for those of us with spouses and children to worry about. I duck into one of the long-since-emptied corner offices, which enjoys a panoramic view of the nocturnal cityscape, including Tokyo Tower. The city below hums with activity and beckons to me, but I take solace from the number of office workers I can see pacing around in neighbouring buildings. A few floors down, I see a surprisingly animated man presenting to a meeting, flapping his arms as if preparing to leap out the window and take flight. I think to myself that he must be feeling frustrated and overwhelmed, then realise I am probably projecting. Denny was right: I do need a drink. One of the inescapable facets of working in a country so dependent on exports and foreign business is the hours. They tend towards the long and unusual, and nowhere is this more evident than among expats. 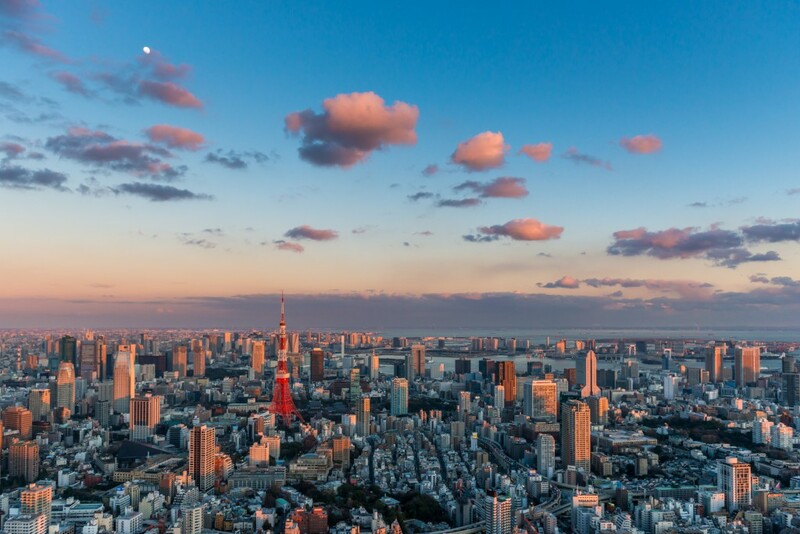 When clients and colleagues are primarily based in New York, London, or somewhere in between, Japan seems to adjust to accommodate those hours. For many of the bengoshi (Japanese lawyers), this means days that begin at 9.30am and end at 4am. For gaijin like me, the rough edges are slightly blunted, and instead I work 2.30pm – 11pm most nights, with smatterings of overtime that keep me at work well beyond the last trains (which, even in a huge city like Tokyo, generally stop running around 1am). I try my best to hide it, but I am secretly thrilled about our venue. 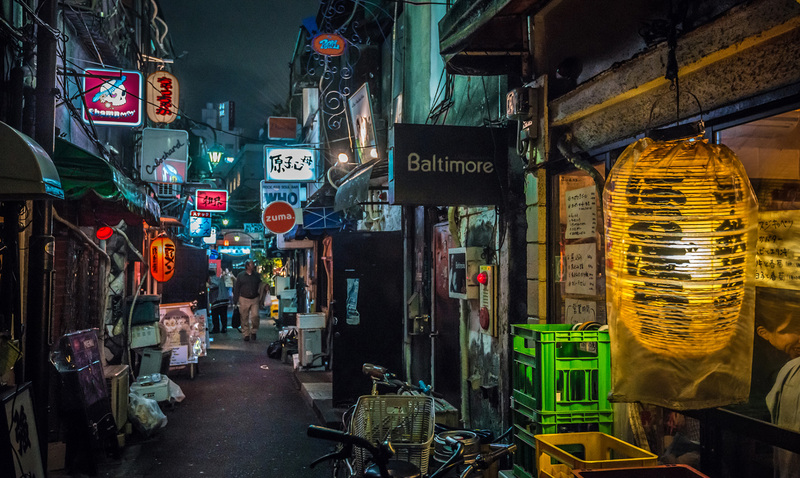 Goruden Gai (‘Golden Street’) is a rabbit warren of rickety, interconnected dive bars and watering holes, tucked up the back of Shinjuku, predominantly built in wood and sheet iron. It was once a hotbed of prostitution and the dark arts, but it has since been claimed by a bohemian sect of Tokyo that is otherwise invisible, at least in the cold light of day. 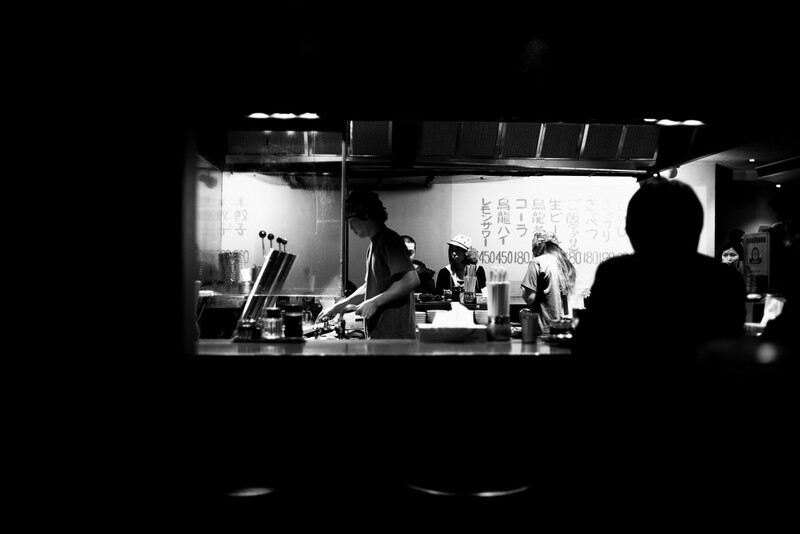 It is precisely the opposite of the kind of place that Denny, and most young gaijin in Japan choose to go, substituting the endless vertical columns of neon so ubiquitous in Roppongi or Shibuya for cheap, flickery lamps and chalkboard. With most of its bars only opening around 10pm (and clearing out around 5–6am to coincide with the resumption of train services, perhaps the only similarity it shares with Tokyo’s dance clubs), Golden Gai has traded the ‘oonst-oonst’ for unheard-of jazz records, and the glittery, made-up young ones give way to an interesting, damaged crowd in their 30s to 50s. Given that most of its bars seat only 6–10 patrons each, it ensures a level of intimacy in a city where eye contact is a rare and precious thing. Establishing a network of friends and supporters in Tokyo can be tough. Not only is there a (slowly-eroding) language barrier, but gaijin are often regarded as temporary novelties, rather than long-term friendship material. This perception is not totally unwarranted, given the country saw large-scale desertion by expats following the March 2011 earthquake and ensuing nuclear catastrophe — resulting in the word ‘fly-jin’ entering the popular vernacular. 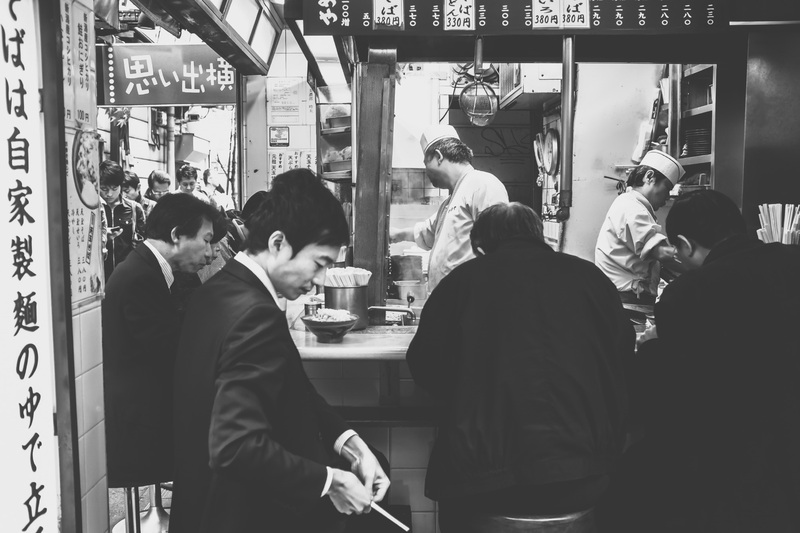 Moreover, like any big international city, Tokyo’s population tends towards the transient, with much of its workforce hailing from outside Tokyo, staying a number of years, and then moving on, which can make forging long-term friendships an exhausting prospect. This is reflected in my company for the night: Denny, a University of Toronto law graduate who has joined my team for a year as an intern, and Toshi, a single 30 (40? )-something engineer-turned-lawyer from Osaka, who plays bass guitar in a doom metal band and builds robots for a hobby. In addition to his apparent agelessness and variety of interests, Toshi has a breadth of life experience and open-mindedness that is lacking in many of his salaryman (white-collar male worker) peers. 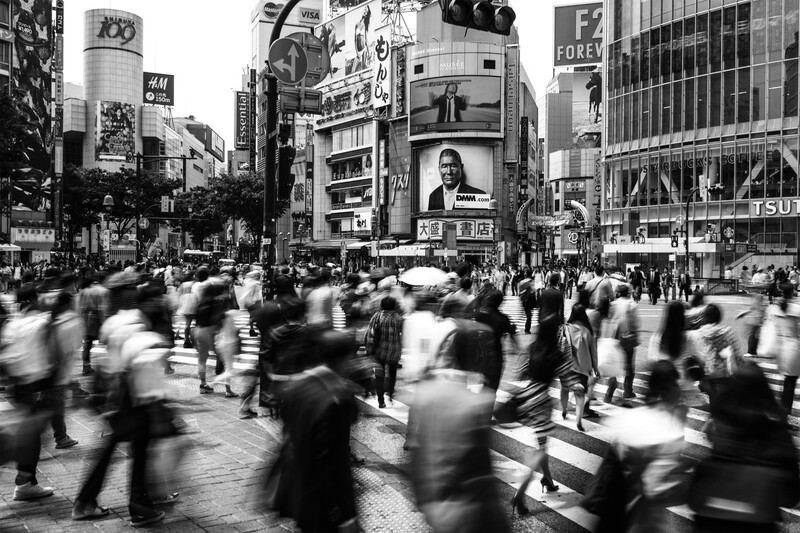 In the post-bubble Japanese economy, Toshi is one of a fast-decreasing number of Japanese men who’ve had the courage (and financial means) to spend a couple of years living abroad, and with that comes insight into the challenges that foreigners face overseas. In other words, he is exactly the sort of local any gaijin wants at their side in the labyrinthine streets of Tokyo, especially when one has Denny as their charge. With around 200 bars scattered through Golden Gai’s six small alleys, Toshi takes a gamble by leading us into the curiously named Kangaroo Court. He has never been here before, but the clientele looks promising: two red-faced salaryman are already in full, loud-speaking, back-slapping mode, and in the corner a pale-faced lady dressed exclusively in black is blowing smoke rings (Japan has no laws restricting smoking in bars or restaurants, although some more reputable establishments have established policies of their own), her eyes fixed on an ash-tray already piled high with discarded cigarettes. “Three beers, thanks.” My Japanese, though not brilliant, is perfect for these sorts of encounters. “And four waters,” chimes in Denny. “Uh, three will do thanks.” I assume Denny is just struggling with his counting in Japanese. Even as he rambles, Denny’s gaze seems fixed on Smoke Rings, who shows no interest in returning it, and whose hair has fallen over her eyes. “That sounds more like The Wizard of Oz,” Toshi chimes in with unexpected aptitude, although his intonation suggests he would quite like the conversation to end here. Presumably not feeling sufficiently concealed, Smoke Rings exhales a near-impenetrable blanket of smoke that removes her from the situation entirely, and I wonder whether she will still be there when the smoke clears. The Backslappers have stopped their loud-talking, and their crinkly-eyed smiles have morphed into sincere looks of concern and embarrassment for our group. I feel the prickly heat of shame creeping up my face, and Denny, still grinning broadly, looks like he wants to take this metaphor further. “Um, so, busy tonight?” Toshi looks to the barmaid for an escape, as she hands us our four waters. It’s a fact of living in Japan that one will meet some pretty unusual gaijin. It’s hard to say whether they started out this way, or whether living here slowly dissolved their social filters. Whatever the case, Japan certainly provides a neutral space in which their idiosyncrasies can be fully expressed. Which is not to say that gaijin are, as a whole, badly-behaved (they are not) — just that compared to the Japanese salaryman, there is no escaping that we are the Other: welcomed and well-tolerated as guests, but not expected or especially encouraged to establish a permanent abode here. Once our beer arrives, things slowly move on for the better. It turns out that the Backslappers are cram school teachers. One of them, who teaches French, spends some time trying to arrange a date between me and his 23-year-old daughter. He employs the powerful opening gambit of telling me that I look like Daniel Radcliffe (I respond that he looks like Jackie Chan), and after I rebuff the invite, suggests I could meet his 21-year-old son instead, who has recently come out as gay (quite unusual in Japan, and certainly unusual for a father to speak about publicly). Eventually I deploy the nuclear option of showing him photos of my wife and son. Other travellers file in and out as the morning wears on: an Australian banker and his Japanese girlfriend are visiting from Sydney, and want to know where to go clubbing. I suggest our eight-stool bar is probably not the place to look, while a young lady with two miniature dachshunds in her purse arrives and promptly unloads them onto the bar (it seems that hygiene inspections are not a great priority here). Even Smoke Rings turns out to be friendly, although she casts especially fierce looks at the barmaid each time she wants her ashtray replaced. Sometime after 5am, it strikes me how bright it’s become. The night has receded and light streams in through small, window-like cracks. Toshi’s head is slightly bowed and his eyes are closed, having apparently fallen asleep mid-conversation with the barmaid. Denny wants another beer, but the barmaid puts on Radiohead’s The Bends set to ‘obnoxiously loud’, which I take as a pretty clear signal she wants us out. We are, after all, the last customers. We pay up and shuffle a near-catatonic Toshi into the blinding morning light. A gentle rain has begun to fall, and I wonder how this will work out for the littering of salarymen who have opted to sleep on the streets between Golden Gai and the station, briefcases and belongings scattered around them. Nagi is famous in Golden Gai for its ramen with a special broth made from dried baby anchovies. Japan has many such strongly-flavoured breakfast offerings, and while ramen is excellent at soaking up alcohol, the thought of standing in a queue in the rain with tens of other people suffering early morning existential crises is not the most enticing prospect. I imagine my 15-month-old son is probably waking up about now, and feel a sudden urgency to get home. “Uhm… no, what I need is sleep. Good night.” Although it is no longer night by any stretch of the imagination — and I’m aware I said something similar about 8 hours earlier — this time, I mean it.